The kindest thing I can say about the Imperator Pro, a gaming keyboard from Taiwanese company Genius, is that it works exactly as advertised. Keys, both standard and programmable, function as intended and do what a user would expect them to. That's a big plus, in a keyboard. Light bleed. When number lock is on, the light bleeds over into caps lock. The red lights for lock are also enough brighter than the keyboard's natural backlighting that they're distracting, keep catching the corner of my eye and making me wonder, "what's that?" Hard to read typeface. The laser-etching doesn't look crisp; it looks cheap and shoddy, as if someone had muffed the edges of the stencil. The symbol row above the numbers is particularly bad — I can see half of the @, half of the #, and if I didn't know what the ^ was I wouldn't be able to tell. The interior structures of the keys are also visible through the etching, making some figures hard to read. Rough feeling. The matte key surface, which at first seemed like a brilliant idea, ended up feeling rough and high-friction against my fingers. Although it wasn't flaking in the slightest, I couldn't shake the feeling that it was sticking to my fingers, and kept expecting to see flecks of black paint stuck to my hands. Loud typing. It kind of started to sound like 1994 in here, with the loud and hollow noises of typing echoing around. If the Imperator Pro were a mechanical keyboard, the noise would make sense — but it's not. Cramped feeling. The so-called palm rest at the bottom isn't really much of a palm rest, and the keys feel crammed in together. Between the two, I find that I keep pulling my hands up, as if to try to use the "palm rest" under my actual palms or wrists instead of under the ball of my hand, and that's making me hold my fingers like claws. Bad backlighting. I thought the default color of the keyboard's LED lighting was a soft seafoam green. I actually liked it. Then I installed the drivers and started playing with the settings and realized: that was actually its interpretation of white. The green cast affected a number of other colors I tried, as well. The Imperator Pro is not a feature-heavy keyboard, and so it would be great if the features it did have worked exceptionally well. Sadly, they don't. The rainbow lighting in the demo pictures is misleading; the keyboard can be set to only one color at a time—though it can be made to blink at different speeds, should you want it to. The dual USB ports are handy, because for some reason the keyboard has a dual plug into the PC, so you get both slots back. And the programmable keys are, well, programmable keys. This is a gaming keyboard that tries hard to mimic the features that are important to gamers, but it's not particularly innovative or good at doing that. And as for just plain being a keyboard — that delightful multi-tool that lets you use a computer to its utmost — well, it's not great at that either. I'm not just a gamer; I'm a writer. I spend every day typing, a lot. I write up stories, I write e-mails, I communicate through IMs and Twitter. This keyboard doesn't feel like a tool that helps me communicate; it feels like an obstacle that hinders me while I try to do so. And while I was able to steer around inside of MMORPGs just fine using it, the cramped feeling that left me constantly hitting the wrong buttons while typing didn't do me any favors while reaching for in-game hotkeys, either. 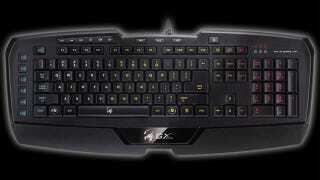 Were the Imperator Pro sold as an inexpensive entry-level keyboard, it might be worth it. However, in the $60 - $90 price range that it sells for across the web, there are dozens of other options from a whole host of manufacturers that will likely better suit most gamers. I had actually started to feel badly for the Imperator Pro by the time I swapped my normal keyboard back in on Tuesday. I took it out of its box carefully on Saturday morning, and yet by Sunday afternoon, the paint on the "A" had already developed a tiny chip on the corner. The feeling that the Imperator Pro was cheap and badly made didn't dissipate as I used it; it got worse. The concept of a low-profile, simple keyboard with a quick set of programmable keys, and a one-touch way to swap them, is a good one. In theory, I like what the Imperator Pro says it will do. In practice, though, it has a long way to go.